Did you know that from iPhones 5s and iOS 8 (minimal) the Apple Health App automatically collect your steps, walking, running and flights climbed data? 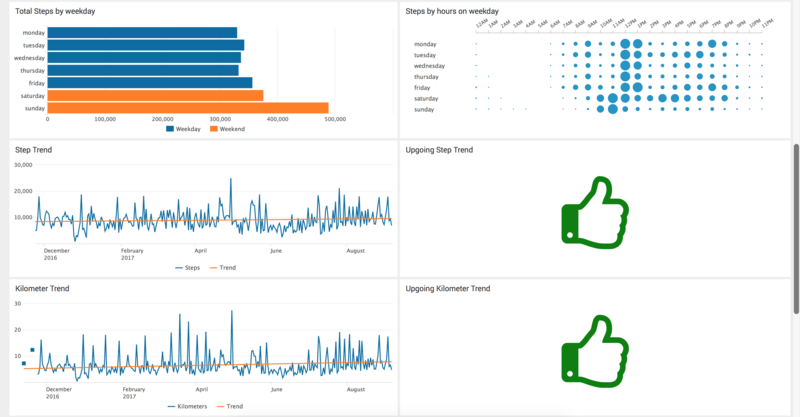 This post will show you how to export, analyze and visualize your Apple Health data using Splunk and in the future other tools like Python, R and Tableau. Go to “Account Settings”, right upper corner. For transfrom the Apple Health data I found a nice python script on GitHub named applehealthdata.py created by Test-Driven Data Analysis, this script will do the trick. Copy the script or clone it from GitHub and run it as below. Finally I have export and transformed the data and can I do some analysis. This post is not going in detail to install, setup and configure Splunk. If you had some questions about the details contact me with the social media icons on the right lower corner on my site. I created a new index (apple) and a new App (Apple Health). For now I will only add the StepCount.csv and DistanceWalkingRunning.csv data to the apple index. Splunk works time based and needs a timestamp of the data when it is indexed. The “endDate” is one of the field headers of StepCount.csv. I want to setup a new souretype “csv:apple:health” with the “endDate” as TIMESTAMP_FIELDS, because Splunk was not recognised the timestamp or choses one of the three timestamps from the data and I want control of which timestamp will be used. The data is indexed and lets run the first search in SPL (Splunk’s Search Processing Language), and answer some of the above questions. Let’s save it to a dashboard panel. This is the first panel we wil saving, so there is no existing dashboard, switch to new and create it directly, the next time we only have to choose existing. Change to the visualisation tab and choose to Single Value and save it to your dashboard. Save it to your dashboard. I do not have multiple year data so I can not compare the years, but if you have you can do the following. change span=1d to 1mon and group by date_year. Go to the visualisation tab and change the visualisation to Bar chart, and do some formating. For this one it’s more visible for using a visualisation add-on. If you have internet connection from your Splunk machine you will be on the Splunk Apps Browser. Search for Punchcard and install it with your Splunk account. After the installation we have a new visualisation installed we will use. Change your visualisation to Punchcard. And follow the steps on wiki.splunk.com. Change the visualisation back to Line Chart. Also for this one we need another visualisation, the used viz is inside a Toolkit with the name Machine Learning Toolkit. We must also install the Python for Scientific Computing Add-on before installing the Machine Learning Toolkit. Choose your appropriate version on the details tab and install both. If everything go well you can choose between another five visualisations on the visualisation tab. Change the visualisation to Outliers Chart. With some rearrangement on the dashboard and adding extra add-ons and some filters you finally have a complete dashboard of your Apple Health Step Data. Have fun with playing around as you can do a lot more with the Apple Health data, maybe you have a HeartRate.csv or SleepAnalysis.csv. If you have questions do not hesitate to contact me with one of the social media icons on my site. The Splunk App I created is available on my GitHub. I will share other tools (e.q. Python, R or Tableau) as soon as possible on my blog with this data. Stay tuned for the posts. This entry was posted in Data, Data Science, Dataviz, Splunk and tagged apple, health, python, splunk. Bookmark the permalink.